Ok, so we've got some good news and some bad news. Which do you want first? The Red Sox completed the four game sweep over the Texas Rangers. Clay Buchholz gave a strong performance: 6 IP 5 Hits 2 Walks and no runs scored. David Aardsma and Manny Delcarmen would give up a combined 3 runs while eating innings with a substantial lead. Kason Gabbard was solid in his 2 innings of work, but left the game after hurting himself after a botched pitch attempt where he lost his balance, or possibly his footing. The Rangers bullpen has been an absolute trainwreck, and with 7 innings to cover it's not surprising that Rangers reliever Dustin Nippert gave up 8 runs over his two innings of work. The Rangers pitching staff gave up an exorbitant 11 walks, not to mention 12 hits, they were lucky to get away with only 8 runs on the books. Manny Ramirez took his scheduled day off despite the fact that his early ejection from the game yesterday was essentially a day off, but fortunately the Red Sox managed to get it done despite missing their leading RBI man. David Ortiz hit two doubles to rack up 3 RBI's, but Ortiz wasn't the only hot bat. Julio Lugo was 4 for 4, Dustin Pedroia was 2 for 5 and Jacoby Ellsbury was 2 for 4. A solid win on both sides of the plate. 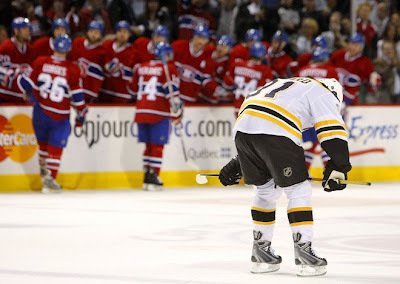 The Bruins lost to the Habs 5-0, season over. I give this team alot of credit. Nobody gave this team a shot, but they fought hard when they could have gone down quietly and in doing so grabbed back some of the fan base that has been ignoring them for a while. Hopefully this is an indicator that the franchise is headed in the right direction. Despite all that's been going on in the Boston sport scene lately, I've actually found it a bit overwhelming to try and keep up with everything. Perhaps a quick recap of the relevant information will do. Despite having the 31st pick overall taken from them as punishment for the cameragate/spygate incident against the Jets, the Patriots made the smart move of trading up with their pick to get the 49ers pick this year. Luckily, the 'Niners tanked it this year and will be handing over the 7th pick overall to the Patriots. Experts seem to have trouble guessing what the Patriots will do with their pick as there are really no glaring holes on the Patriots. The most likely scenario is that the Patriots will trade down their pick to another team and fall back to it's usual plan of finding late pick gold. Otherwise, if Jake Long (OT Michigan), Chris Long (DE Virginia), Darren McFadden (RB Virginia) or Glenn Dorsey (DT LSU) don't get picked by the time #7 rolls around, any of these gentlemen would make a fine addition to the New England Patriots just on the basis of their sheer talent. In a related story Boston College's Matt Ryan is being highly touted as the top QB prospect in the draft. As much as I like Matty Ice and what he's done for the Eagles, I think he's being a bit overrated and reaping the benefit of factors outside his control: A weak QB class this year and a number of teams looking for a centerpiece Quarterback to start rebuilding their franchises. In all likelihood Matty will be heading to Miami or Atlanta and have some rough seas ahead as it is unlikely he'll be able to turn those teams around. The Red Sox have been used to being the only game in town this time of year, but that's not the case this year. The Red Sox are cruising at this point: They are on a 4 game winning streak, they have the best record in the AL at 13-7 and outside of a 15-9 loss to the Yankees that exposed the weakness of the Boston bullpen. Mike Timlin has been a huge liability since his return from the DL and it might be an indication that he doesn't have any gas left in the tank. Tomorrow the Curse of Eric Gagne may come back to haunt us again as former Red Sox pitching prospect Kason Gabbard (Traded to the Rangers in exchange for their closer Eric Gagne), will match up against current Red Sox pitching prospect Clay Buchholz. Gabbard has been solid across the boards in his 3 starts this season, giving up 7 hits and 2 walks in each of his outings, has a 2.41 ERA and 1-0 record. I was concerned that after weeks of playing meaningless games the Celtics might lose their edge heading into the playoffs, but they had more than enough energy to put away the Atlanta Hawks in the first game of the first round of the NBA Playoffs. The game looked tight at certain points in the opening half; the Celtics would establish a big lead, the Hawks would storm back, but they stopped storming back in the second half and the lead just grew and grew until the time ran out 104-81 Celtics. The points were actually spread out very generously with Ray Allen posting a team high 18 with Pierce, KG, Rondo, Cassell and Powe all putting up 10 or more. If the Celtics continue to play the kind of basketball they've played all year, they should easily cruise into the second round. Elsewhere in the NBA playoffs, the Pistons blew a large lead to the 76ers at home and lost 90-86. If the 76ers can keep the momentum there might be an upset in the making. I don't really follow hockey much, but I must admit that the Bruins have captured some of my attention by threatening to knock off their arch-rivals, and number one seed, Montreal Canadiens. I figured this series was over when the Canadiens went up 3-1 in the series, but the Bruins have responded in dramatic fashion by beating the Canadiens 5-1 in Montreal and 5-4 in Boston to even up the series at 3-3 and forcing a deciding game 7 in Montreal. 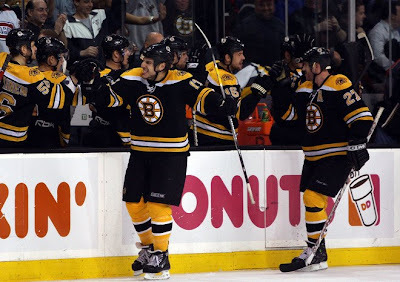 If the Bruins manage to pull the eight seed over a one seed upset the bandwagon jumping will begin. Oh, and did I mention BC won the National Hockey Championship? 10 games down and the Red Sox are at a somewhat disappointing 5-5 record and we can see some early trends developing. JD has picked up where he left off last year in the playoffs and appears to have found his comfort zone here and earning some of that big money he's getting paid. In 7 games he's 11 for 25, hitting .440, has two homeruns and second on the team for RBI's with 7 and has drawn 3 walks. Let's hope he can keep up the pace. The seemingly redundant off season acquisition has already proven to be a worthwile asset. He's 5 for 14, hitting .357 with two doubles. With Mike Lowell's recent minor thumb injury keeping him on the DL for a bit we may be seeing more of Sean Casey at first and Kevin Youkilis moving to third to cover. Youk has been money in the bank thus far this year. Youk has played all but one game despite having an excellent backup in Sean Casey which attests to the strength of his performance this thus far. Youkilis is 11 for 34, hitting .324 with 3 doubles and 2 triples and posted six walks. With that said, Youkilis always starts off red hot and cools off after the all-star break. Many people, including myself, felt it would be beneficial for all parties if the Red Sox traded Coco even if it meant getting less value for him. Coco clearly is good enough to be a starter in the majors and it seemed like he would be riding the pine based on Jacoby Ellsbury's strong performance last year that got Coco benched for the World Series. Tito has done a fairly good job of splitting time between Jacoby and Coco with Coco getting 23 at bats to Jacoby's 17. In the first ten games Coco has made more productive use of those at bats going 7 for 23, hitting .304 and drawing two walks. Coco does have every reason to be playing hard, he might be able to earn back the top spot or possibly bump up his trade value and make him easier to move when the trade deadline rolls around. Much like JD Drew, Julio was a constant disappointment last year that seemed to do a little better come playoff time, but this year Julio seems to be off to a good start. Julio is 10 for 33, hitting .303. Julio's fielding has been a problem with 4 errors in 9 games. I combine these two because it's basically the same story. Both of them have been well rested thanks to blowouts in either direction and have great ERA's, picking up right where they left off last year. This has been a big part of what's wrong with the Red Sox offense, Big Papi has hit a serious slump going 3 for 36, that's .083, in 10 games this season. Two of his 3 hits came in the 5-0 win against Oakland on April 2nd and is hitless in 8 of 10 games this season. Big Papi still knows how to work counts and commands respect with his bat, as evidenced by the 9 walks he has drawn thus far this season, tied for most in the AL. There is some suggestion that this might be a slow bounce-back from offseason knee surgery, I don't personally believe this is the case, but I'm not a doctor. I think with some time Big Papi will find his swing. We got a taste of Jacoby's potential last year, but he seems to be having some trouble adjusting to the idea of being a permanent starter and has been splitting time with Coco Crisp in center field. Jacoby is 3 for 17, hitting .176 including a homerun and drawing 3 walks. This seems somewhat reminiscent of Dustin Pedroia last year. Dustin had some trouble adjusting to the big leagues, but by season's end he was a Rookie of the Year candidate. It's a little too early to say anything about the starting rotation just yet. Bucholz and Beckett both have only one start each. Beckett's ERA is inflated from Manny Delcarmen giving up a grand slam that scored 3 inherited runners with 2 outs in the inning, which accounts for 3 of the 5 earned runs on the books for Beckett. Dustin is one of 3 players to start all 10 games so far this season. In that time he's posted a respectable 11 for 40, hitting .275 including 2 doubles and 5 walks. A comfortable pace, but nothing to get excited about. Manny is alot like Dustin, he's also started all 10 games and posted 11 for 40, .275 but with only 3 walks and a team high 12 strikeouts. Manny currently leads the team in RBI's with 8. Manny has hit a number of extra base hits with 5 doubles, 1 triple and a homerun; but this is nothing special for Manny. I think this is a little disappointing given that Manny is in a contract year and the strong start he had to this season. Last year's World Series MVP is off to a slow start 6 for 30, hitting .200 and 3 walks. Mike recently injured his thumb while fielding a ball and will be on the DL for a while. With both Dice-K and Jon Lester looking terrible in their performances against the A's while in Japan, there was reason to be concerned as these two would start the following two games in Oakland in the same pitching matchups. Fortunately, Dice-K and Lester both seemed to find their grooves early, Gave 6 2/3 IP and the only run given up between these games was a solo homerun off Dice-K. The bullpen was also unscathed with Jonathan Papelbon ending the first game with authority by striking out all 3 batters he faced in the 9th inning protecting the sox slim 2-1 lead and recording the save. Bryan Corey and Manny Delcarmen would give a solid performance to wrap up the 5-0 win the following night. A confidence inspiring performance all around by the Red Sox pitching staff. The Red Sox bats were adequate but a bit disappointing at times. The quantity of hits isn't the problem, but more so that it seems that the Red Sox are squandering opportunities. In the first game the Red Sox had 9 hits and a walk, but only managed to put up two runs. In the second game the Sox had 13 hits, 5 walks and had two batters hit by pitch, that's a grand total of twenty base runners, but only managed to yield 5 runs. The Red Sox had multiple low-out/bases loaded situations but continually failed to capitalize thanks to strikeouts and hitting into double plays. It was a solid win, but easily could have been a complete rout if the hitting had been a bit more timely. There is some good news on the hitting front, both Big Papi and Jason Varitek seem to have broken out of their respective mini-slumps that had me so concerned in the previous post. Varitek went 4/8 in the two game series including a homerun and a homerun that was mistakenly ruled a double by the officiating crew. Big Papi was not quite as impressive with his 2/8 performance (both hits coming in the second game), but showed that he's still got it by blasting a 2 run homerun to kick off the Red Sox offense. The Sox have Thursday off and open up a three game series against the Jays in Toronto on Friday. Sox Ace Josh Beckett is expected to start the third game which should match him up against Jays Ace Roy Halladay, should be a hell of a game. The Fenway park opener is April 8th against the Tigers.